The condition of your soil can play a big role in how well your plants thrive in your landscape. If the water from your current irrigation system doesn't moisturize and circulate through the soil properly because the soil is too compacted and dry, the plants' roots won't survive. In addition, the microorganisms that protect your plants may also reduce in number or completely die off. One of the things you can do to protect your plants is to condition your soil. Soil conditioning works similar to how you condition your hair. If your hair lacks the proper moisture, it dries out and breaks easily if you don't condition it. Your plants and vegetables can react the same way if the soil supporting them lacks moisture or oxygen. The water from your irrigation system won't hydrate the roots of plants properly. In most cases, the majority of the water will spread throughout the soil instead of stay confined to your plants' roots. Eventually, the soil around the roots dry out. The beneficial fungi and bacteria that live around your plants' roots die from a lack of moisture and oxygen. Beneficial microorganisms help roots absorb air and moisture from your soil by destroying plant-eating pests and harmful microorganisms. If the beneficial microorganisms die, pests and harmful microorganisms that don't need healthy soil to live take over. Conditioners make soil healthier by creating a blanket of nutrients over the topsoil, which helps it absorb and retain moisture. Conditioners include manure, organic compost and organic fertilizer. When organic material breaks down, it releases natural gases and chemicals that penetrate soil. Microorganisms that depend on the natural gases and chemicals as food sources may return to the soil over time. The organisms release oxygen as they feed. As the oxygen passes through the soil, it loosens up. The water that surrounds the damaged soil can now flow through it properly. 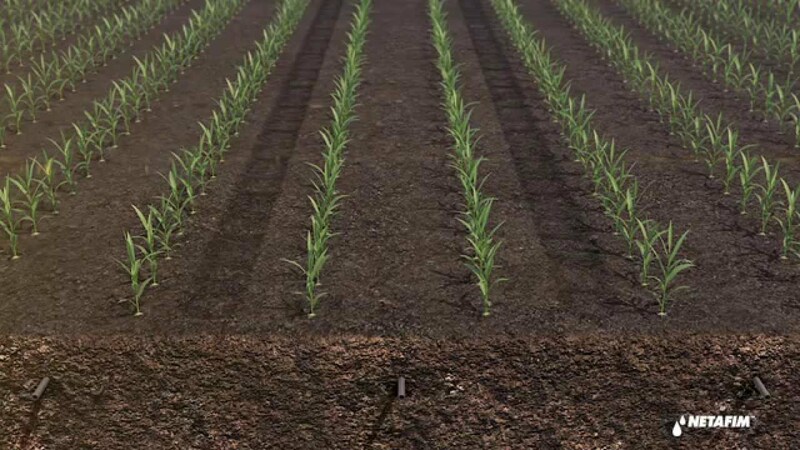 If conditioning your soil doesn't bring it back to life or save your plants, consider replacing your irrigation system with a subsurface drip irrigation system. Most water irrigation systems are placed on top of the soil and grass to water plants. The water needs to soak into the ground to reach the plants' roots. Although this technique may work well for many homeowners, it may not work well for people who have poor soil conditions, such as yours. A subsurface drip irrigation system may save you headaches and problems because it waters your plants from below ground. Subsurface drip irrigation systems feature unique pipes that release water just below your plants' roots. This technique ensures that the roots receive water first, which keeps them healthy. The water from your current system has to pass through soil, rocks and other underground substances before it reaches the roots. Although the actual depth for installing the pipes may depend on the how deep the roots of your plants lie in the ground, contractors usually place the pipes 3-4 inches into the ground and about 18 inches apart. Contractors also set the system's flow rate and watering schedule before they complete the work. These steps help keep your soil properly hydrated throughout the year, as well as save you money on your water expenses. If you experience high utility bills now, you can benefit from installing a subsurface drip irrigation system. After your installation, you may wish to schedule regular maintenance checks with your contractors to ensure that the system works for your soil. If you still have a problem with the soil, the contractors can discuss other irrigation methods with you. For additional information about your soil or a subsurface irrigation system, contact a contractor, such as those at H2O Lawn Sprinklers, today.